The short answer is ‘no’. Through years of experience in the field, we have developed a 6-step methodology to help our students master the ITTOs without memorization with the help of our ITTO Explorer tool. This strategy has proven to be effective for thousands of our students over the past several years. This post describes the methodology that we recommend to our students. ITTO - Memorize or Understand? Some people are blessed with good memory and can game the system with rote memorization even if they lack real project management experience. However, such people are a minority. For most of us, we need some context to the stuff that we want to learn. The good news is that with a good strategy you can easily pass the exam without memorization. The key to mastering the PMBOK® Guide, 6th Ed is to ‘understand’ these processes and their ITTOs. Without further ado, let’s look at how we would go about it using the ITTO Explorer and ITTO Quiz. Do you know how many total Project Management processes and ITTOs are in the PMBOK® Guide, 6th Ed? The Guide has 49 processes and 1452 ITTOs. That is indeed a tall order. In fact, chapters 4 through 13 of the Guide primarily focus on these 49 processes and their 1452 ITTOs. Even if you are an experienced project manager, you would find plenty of things that you’ve not used on your job. Before you dive into the ITTO Explorer, skim through the PMBOK® Guide once. You should at least be familiar with the structure and content of the Guide at a high level. If you have an exam prep guide at your disposal, we suggest that you go through it as well. This will give you the necessary foundation to build upon. Processes: The first step is to be able to recognize and understand what these processes are. 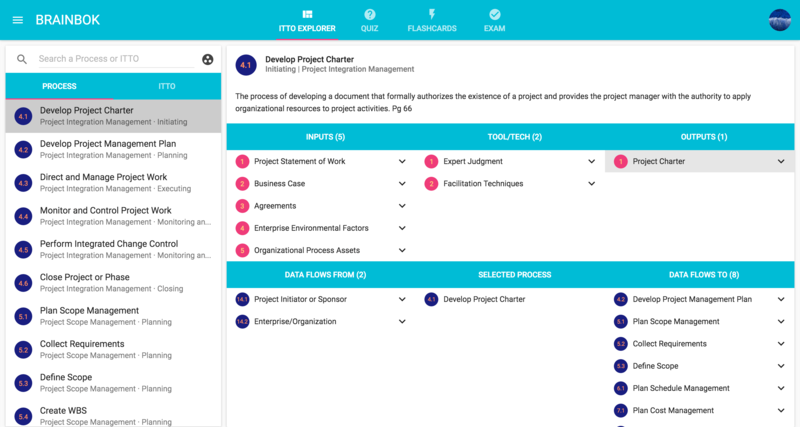 Using the ITTO Explorer, select each of the 49 Project Management processes one-by-one and understand what it is and what its purpose is. ITTO: Similarly, select each ITTO and make sure that you understand what it is and what its purpose is. Don’t worry about the flow or where it’s used or anything else. Simply focus on understanding each ITTO individually first. There are 1452 of them. Be patient as it will take a while to get through all of them. Let’s take the example of Bottom-up Estimating. Just by looking at the name, can you tell what it is and what its purpose is? If you can answer this part for each ITTO, then half the battle is won. ITTO by Process: Select each process in the ITTO Explorer and look at its ITTOs. Click the down arrow next to each ITTO to reveal the reason why the ITTO is used in the selected process. You do not need to memorize or recall the list of all the ITTOs for any given process. Where used of an ITTO: Now do the reverse of step 3. Select each ITTO in the ITTO Explorer to learn where it’s used and why. Again taking the example of Bottom-up Estimating, find out the processes where it’s used and why. Again, no memorization, just understanding is enough. If you perform this exercise using the PMBOK® Guide, you’ll have to shuffle back and forth and waste a lot of time on this step. That’s where the power of the ITTO Explorer comes to rescue. Data Flow: This is the final piece of the puzzle in mastering ITTOs. If you have done steps 1 through 4 well, then this part wouldn’t be hard. ITTO Explorer will help you a lot in this area as well. Select each of the 49 processes in the process list one-by-one. The process details panel will show the “Data Flow From” and “Data Flow To” information. The “Data Flow From” list shows the processes “supplying” inputs, and the “Data Flow To” list shows the processes “receiving” outputs of the selected process. If you click the down arrow button next to the supplying or receiving processes, you’ll be able to see what data (inputs and outputs) is flowing in/out. This is immensely useful in understanding the interaction among the processes. Test your knowledge: Once you have completed the 5 steps listed above, head over to the Quiz module to test your knowledge. The exam will not test your memory. It will only test your understanding. Remember that it’s a multiple-choice question (MCQ) type test. You don’t really need to recall and write answers. All you need to do is to ‘identify’ the correct answer among the 4 given choices. Let’s drive home the point with an example. Let’s say you are given a process name and a list of 4 tools and techniques as answer choices, and asked to identify the one tool or technique used in the given process. In this case, you only need to ‘identify’ the correct answer from the list. You don’t need to recall and list all tools and techniques of that process. It isn’t that hard if you follow the 6-step strategy mentioned above. We offer 250+ ITTO related flashcards in our Flashcards module. These flashcards particularly focus on ITTO ‘gotchas’ and things that are not obvious. Make your own study notes (either online or on paper). We are huge proponents of online tools (such as Google Docs, Google Keep, Notes on Apple devices, etc.) for note taking and maintaining a personal knowledge repository. Make use of study aids such as mnemonics. If you apply yourself for a few days on this exercise, you’ll surely be able to master the ITTOs. Again, be patient, put some effort and see the results. We hope that this strategy works for you. Your feedback is welcome.